The Best Western Plus Moosomin Hotel is located on the TransCanada Highway approximately 20 kms west of the Saskatchewan/Manitoba border. Moosomin is a small town of approximately 2,700 residents. This 79-room Hotel is relatively new having opened about 2.5 years ago. There is ample parking available both in front and behind the building. The frontage road also allows space for Semi-trailers to park. The lobby area is very open and inviting with a fireplace and several couches located across from the Front Desk. A good place to relax and meet friends before heading off to your room or out to dinner. The Front Desk itself is located to the right as you walk in and has space to accommodate two sets of guests checking in (or out) at the same time. The staff were very professional and outgoing when I arrived and acknowledged me as a member of the Best Western Rewards program. I had reserved a single King, but I ended up with an upgrade to a King with sofa bed and kitchenette due to my Diamond Select status. The check-in process was very expedient, and I was given a welcome bag with 2 bottles of water, a small bag of mixed nuts and a snack bar. There is even a jar with complementary fresh cookies that you can help yourself to. My room was on the third floor close to the elevator. This Hotel uses the room keys that do not have the magnetic strip. Hence you don’t have to struggle inserting it the right way when your hands are full, it just needs to be waved at the lock to open. The room was very neat and clean with a comfortable room temperature. Quite often when I get to my room the temperature is either stifling or way too cold. This was very nice to not have to immediately adjust the temperature. It was tastefully decorated with plenty of room for my luggage. (Even on a short trip, I usually have a suitcase, computer bag and camera bag). The 10’ ceiling gave the room a very open feeling which contributed to the overall comfort of the room. The bathroom had a single sink with plenty of counter space and very good lighting. There was even a light over the tub. The shower nozzle is about 7’ from the bottom of the tub, so that even taller people can have a comfortable shower without having to stoop to get their head under the water for rinsing. Shampoo, conditioner and shower gel are provided in dispensers right in the shower. This is handy as it means you don’t have to get out of the shower to get the shampoo you forgot to bring into the shower with you. The water pressure was very good, and the water didn’t take long to heat up. The kitchenette would be quite handy for someone staying a few days who wished to cook something of their own. The room is supplied with pots/pans/cutlery and place settings for 4. There is also the usual Keurig coffee maker, microwave and mini fridge. The 42” flat screen TV is within a good viewing angle from either the bed or the sofa. Unfortunately, there is no HDTV (as is quite common in most hotels). The hotel doesn’t provide a channel listing, but there are 50+ channels to choose from. There is a small desk available for your computer and other electronics with 4 electrical plugs available at the desk. All of these are located at desk height; therefore it is not necessary to have to climb under the desk to connect your equipment to charge. I found the Wi-Fi to be very good and did not experience any issues with disconnects or slow speeds (even with watching a Netflix movie). Lamps are located on either side of the bed, both of which have an electrical plug. Very handy if you’re like me and use your phone for an alarm clock and still wish to have a full charge in the morning. The bed itself was quite comfortable, it was easy to fall asleep and get a restful night of slumber. Even with my room facing the highway, the traffic noise was quite minimal and didn’t interfere with the quality of sleep. There is a 24-hour Business Centre available located just off the lobby offering 2 computers and a printer for guest use. The Fitness Centre (also available 24-hours) has a good selection of exercise equipment including free weights, treadmill, and stepper, to name a few. TV’s are also offered to help you catch up on the news/sports or your favorite show as you burn those calories. The Pool area (7:00 am – 10:00 pm) also includes a hot tub along with half a dozen deck chairs to relax and perhaps read a book while the family burns off some energy in the pool. The maximum depth of the pool is 4’. Breakfast is available from 6:00 am – 10:00 am daily in the Breakfast Room. They offer the usual assortment of juices (Apple, Orange and Cranberry) along with water, coffee and tea. Also available are cereals and toast along with egg wraps, hash browns, ham and assorted bagels and some fresh baked cinnamon buns. The Moosomin Regional Park is a short 14 km drive from the hotel which offers a picnic area, boat launching, fish cleaning station, and a nice sandy beach. If you stop by in the beginning of August, Moosomin also has an annual 2-day fireworks competition (now in it’s ninth year). This location is clean and well run and an asset to the Best Western Brand. I had a very comfortable stay here and would certainly recommend it for anyone travelling through the area. Remember that until September 3rd, 2018 you can earn a $20 Best Western Gift Card for stays at this or any other Best Western hotel. Register for the offer here! Talk to us! 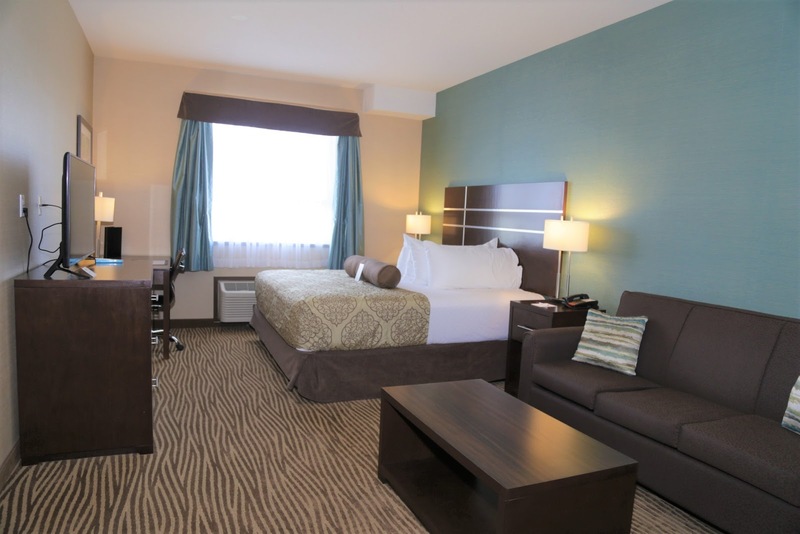 Have you stayed at the Best Western Plus Moosomin Hotel? What are your thoughts of the hotel? Or are you planning to and looking forward to it? Let us know below!